The world we see today is very different from what existed 2.5 million – 10 thousand years ago. During the glacial cycles in the Pleistocene era, ice covered most regions of the world. Such glacial periods witnessed the shrinking of available habitat for a number of species, especially those at high elevations or in regions away from the equator. This restricted movement among species populations due to the reduced connectivity between suitable habitats, thereby affecting gene flow and reducing the overall genetic diversity of the species. Although some species survived in glacial refugia, their populations shrunk during these periods. Studies show that species expanded their distribution following the last ice retreat in … to areas where we now find them across the globe. Such was also the story for a native freshwater fish from Patagonia, Galaxias platei, that survived the Quaternary glaciations. 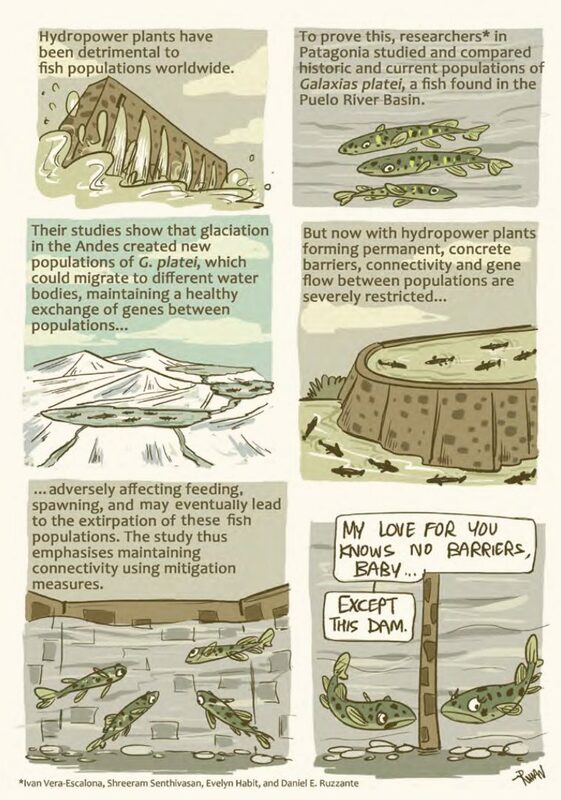 Today, the species faces a new threat that restricts movement amongst populations, the construction of hydropower plants in the Puelo River Basin. The construction of dams is known to seriously limit connectivity among fish populations resulting from the construction of concrete barriers. However, their impact on the genetic diversity of freshwater fauna is not well understood. Our study used a three-pronged approach to study the contemporary as well as past and future genetic diversity patterns of G. platei populations in the Puelo River Basin as a case study. This approach can enable learning from past to understand the present and predict future diversity patterns following landscape alterations. As such, it can be used to inform conservation policies that help mitigate impacts of human interventions and climate change on species. Unfortunately for the G. platei, our study shows that although connectivity was relatively high in the past, there is low genetic diversity in the species today making them highly susceptible to changes in landscape. The construction of dams in the Puelo River Basin will reduce connectivity among populations which will only exacerbate the decline in genetic diversity and may even result in the extinction in three out of the four populations examined for this study. patterns of native species and the impact of landscape modifications and the introduction of invasive species on them. a series of cartoons, comics and illustrations on wildlife, nature conservation, environment, sustainability and all things green.